DVP-100B is a professional set of tools that is specially designed for maintaining fiber optic networks. 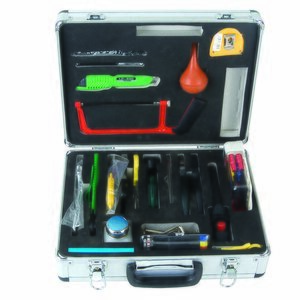 DVP-100B tool set include: strippers, pliers, screwdrivers, wrenches and many more instruments for fiber optics. Fiber optic stripper 1 pc. Horizontal cable stripper 1 pc. Cable breaking pliers 1 pc. Rubber suction bulb 1 pc. Pen-type fiber cleaver 1 pc. Diagonal cutting pliers 1 pc. Long flat nose pliers 1 pc. Vertical cable stripper 1 pc. Replacement blade for knife 1 pc.